I like to express my deepest appreciation to you all for your presence here this evening. I’d especially like to express my gratitude to Archbishop Martin for agreeing to launch this booklet and for his wise words. I’d also like to thank the President of DIT, Professor Brian Norton for his hearty welcome to this exciting new campus this evening. I’d like to thank my family, friends and colleagues in DIT and beyond and my Chaplaincy colleagues for your presence and support. I also like to thank the team at the Messenger Publications for their confidence in me when they asked me to put this together, their patience as I tried to draw it to a close and their editing skills. I’d like to acknowledge the vast array of people who are not in this room who have become part of this story. The University of Notre Dame, members of the World Council of Churches, Mediterranean Hope, Calderwood School of Silversmiths based in Scoil Mhuire Marino, and the people of Lampedusa and Rwanda who have allowed me to see our world differently. The key word for this publication is accessibility. The size of the publication, its price, and its comfort (it can fit in your pocket) aim to make a very complex situation more accessible to a wide audience. There are many people who are rightfully concerned about the plight of those who knock on the doors of Europe and are actively searching for a vison to assist them as they seek to make a difference in their communities. There are three points I’d like to make this evening in these few short words. Firstly: the crisis; secondly, the Chalice and thirdly ourselves. This era sees the largest migrant crisis since World War ll but his crisis is a two-fold one. It is a crisis for those who have to leave their home for fear of their lives carrying a hope for a better and more secure future. But it is also a crisis because it shows our inability to respond; the crisis is as much Europe’s as it is the migrants. After the Second World War there was a desire to address the needs of those who are displaced; this is less the case now. Never before in the story of the world have we had so many global institutions whose mandate it is to build order and to work for peace and never before have we had so much inaction in the face of a crisis. Migration is a mirror for our world today; we look into that mirror not just to see the face of the other but to look at ourselves and observe our actions and our inactions. Our present world order has created a greater divide between politics and power. This current crisis is revealing that the fall-out from globalisation is increasingly irrelevant for the less well off. Furthermore the creation of agencies and bodies by political institutions is building an edifice whereby those elected to power are distancing themselves from their responsibilities. The ongoing raft of short term and interim fixes to every problem reveals a world order that is becoming devoid of solutions to the problems that face us. In a third level setting one cannot make such statements without evidence based research. The evidence for this is beginning to put their heads on concrete pavements this evening on the streets all about us. Further evidence of this growing gap between politics and power is that the world’s six richest countries which makes up half of the global economy host less than nine percent of the worlds refugees and Asylum Seekers. Ireland’s problem is that she wants to be part of this game-playing and to do this she has to lose touch with the values and beliefs that create an alternative, more inclusive society and world. We have seen many migrant children separated from their families and bereaved on various media outlets as these years pass by. Last year we, Ireland, took one child (unaccompanied minor) into our country. Secondly I like to bring your attention to this chalice. Some of you have seen it and know its story. A carpenter on the island of Lampedusa spent many days and nights in the past rescuing and assisting those who arrived to this obscure Italian outpost as refugees in dangerous overcrowded boats. Frustrated with the suffering and death that he witnessed he took a piece of a broken up migrant boat and he made a chalice that Pope Francis used at Mass when he visited the island on the 8th of July, 2013. It was Pope Francis’ first official visit out of the Vatican and was planned with only eight days’ notice! When I visited the island that same carpenter presented me with this chalice. I brought it back as a simple piece of timber but through a circuitous route I was led to the Calderwood School of Silversmiths where the team set about beating a piece of silver until they formed the cup which was later gilded. Last week I used this chalice at a facilitation for people of faith involved in the Israeli-Palestinian conflict. I told the story and not of the visitors objected to its presence but said, and I quote ‘it was by far a symbol of human tragedy, resilience, perilous journey and life’. The chalice for me is a cup born from human suffering but for the Christian the Chalice also offers the ultimate hope of salvation. The carpenter’s hand crafted the chalice but his hand also offered salvation to many when he reached out to take them ashore. There are many here who may not share Christian faith, they may have another belief system or may not subscribe to any one particular system of belief but I am one hundred percent sure that we can all put out our hands for other; we can all be agents of salvation. 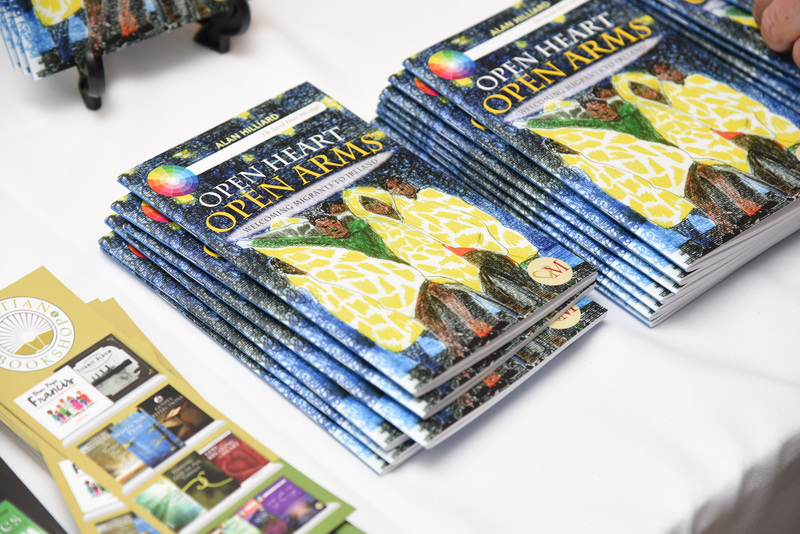 As the title of this publication suggests – if our hearts are open, it is easy to open our arms and our hands to others. Thirdly, and finally, maybe this is an occasion for little reflection on our own lives. A sub heading for this paragraph could also read – how those whom I have encountered have impacted on me. I’ll start with the words of E.B. White, the author of Charlotte’s Web who said that ‘luck is not something you can mention in the presence of self-made men’. There are many today who see their success as the direct result of their own efforts, gifts and talents. This is evident in many political events that are taking place at present particularly in the US Presidential campaign. I don’t know how you view your life and achievements. Are they all self-made or is there the recognisable presence of luck, good fortune or grace? My engagement with those who have made the journey across Africa and the Mediterranean leaves me more aware of the role of luck, good fortune and grace in my life. In the words of Napoleon Bonaparte ‘ability is of little account without opportunity’. Furthermore having worked with those who extended the hand of safety to people in the Mediterranean I note that same change of heart and from this comes an overwhelming sense of gratitude for life. I see this gratitude and trust daily in students of DIT who have come to the college via a human trafficker; their gratitude for the opportunity of education and the deep trust that translates into an attitude whereby no matter what obstacle is in their way they preserve a sense of hope where they can say ‘and all shall be well’. They most likely learnt this at some significant point on their journey. The question may not trouble us but it is an interesting one… ‘am I responsible for my successes or is there an element of luck, good fortune or grace?’ To appease those who again look for evidence they can contemplate research by Robert H. Frank who found via control groups ‘that gratitude makes people not only happier and healthier by also more generous towards others’. The findings suggest that a greater appreciation of the role of luck, good fortune or grace makes everyone better off. This is an excellent question. It has no definitive answer. There were many different chefs of the stew that is you: parents, friends, teachers, ancestors, mentors and, of course, Oprah Winfrey. It’s very hard to know how much of your success is owed to those people and how much is owed to yourself. As a wise man once said, what God hath woven together, even multiple regression analysis cannot tear asunder…You should regard yourself as the sole author of all your future achievements and as the grateful beneficiary of all your past successes.As you go through life, you should pass through different phases in thinking about how much credit you deserve. You should start your life with the illusion that you are completely in control of what you do. You should finish life with the recognition that, all in all, you got better than you deserved….You’ll still have faith in your own skills, but it will be more the skills of navigation, not creation. You’ll adapt to the rules and peculiarities of your environment. You’ll keep up with what the essayist Joseph Epstein calls “the current snobberies.” You’ll understand that the crucial question isn’t what you want, but what the market wants. For a brief period, you won’t mind breakfast meetings….But you, Mr. Confused in Columbus, are right to preserve your pride in your accomplishments. Great companies, charities and nations were built by groups of individuals who each vastly overestimated their own autonomy. As an ambitious executive, it’s important that you believe that you will deserve credit for everything you achieve. As a human being, it’s important for you to know that this is nonsense. Thank you for being here this evening. Maybe these words will encourage you to read the book with this question before you – ‘wherein lies the crisis?’ Maybe you will be encouraged to be an agent of salvation for someone or maybe you might just begin to live with a greater sense of gratitude. For a deeper exploration of this issue read: Zygmunt Bauman and Carlo Bordini (2014) State of Crisis, Cambridge, UK Polity Press. Robert H. Frank Just Deserts: Why We Tend to Exaggerate Merit –m And Pay for Doing So, The Hedgehog Review, Vol 18, No. 2, (2016): 50-62. Con Harvey – The Harbour ‘Master’. Frank Cullen -The Master Craftsman R.I.P.